Season 7 of American Horror Story will explore its most terrifying nightmare yet: the election of President Donald Trump. November 8th, 2016 will live long in the memory as a day of horror and shock, in which the predictions of pundits around the globe were confounded as the new king ascended to his throne. 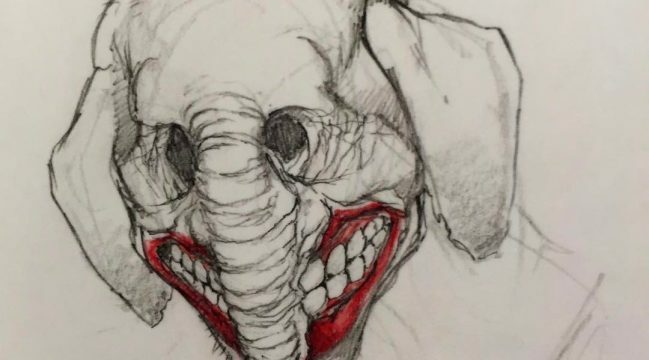 Judging by this, Murphy isn’t going for subtlety in the new season, with no prizes on offer for working out the political symbolism of a horrifying and dead-eyed elephant with a rictus clown smile daubed over the front of it. Creepy doesn’t really begin to cover the image above, and if this is the tone that the Murphy is going to shoot for in season 7, then we’re in for some pretty goddamn weird television. Further details of what’s to happen are thin on the ground. Initial reports suggested that Hilary Clinton and Donald Trump would be off-screen presences throughout, though that was soon scotched when Murphy confirmed that we’d see actors playing them in the full series. If nothing else, it’ll be fascinating to see whose cast as Trump – is Alec Baldwin too obvious? In the meantime, Murphy is keeping himself busy – juggling this, the next series of Feud (about Charles and Diana), American Crime Story and Scream Queens. The man certainly has his plate full, so let’s just hope that he’s got time to deliver a few more American Horror Story teases before the new season arrives.